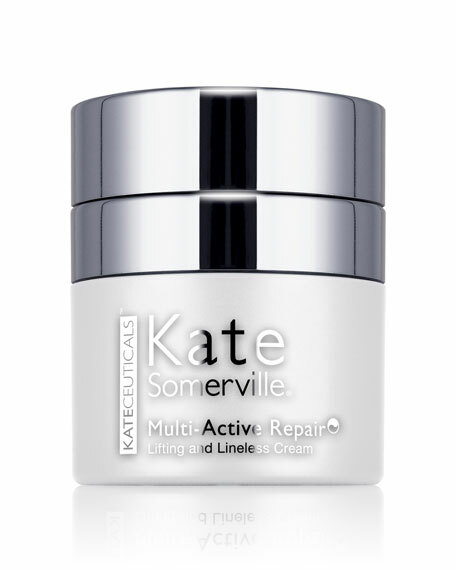 Kate Somerville KateCeuticals Multi-Active Repair Eye Cream, 0.67 oz. Kate SomervilleKateCeuticals Multi-Active Repair Eye Cream, 0.67 oz. Can't believe your eyes? It is pretty amazingthis extreme age defense eye cream utilizes six active ingredients. Cutting-edge Peptide Complex utilizes the latest advances to repair damaged cells and increase collagen production, significantly reducing the appearance of fine lines, crow's feet, and wrinkles. A unique Caffeine Complex instantly alleviates puffiness and firms skin. Moisturizing Anti-Aging Actives not only provide long-lasting hydration, but also stimulate collagen production and repair the natural lipid barrier. Color Correcting Micro-Pearls diffuse and scatter light, diminishing the appearance of fine lines, brightening the entire eye area and masking dark circles. For in-store inquiries, use sku #238306.